Why people attend trade shows? To meet industry leaders and tech giants face to face? To get best deals from exhibitors? To take their business on global level? Well, the above can be considered as the first five reasons to attend any trade show. 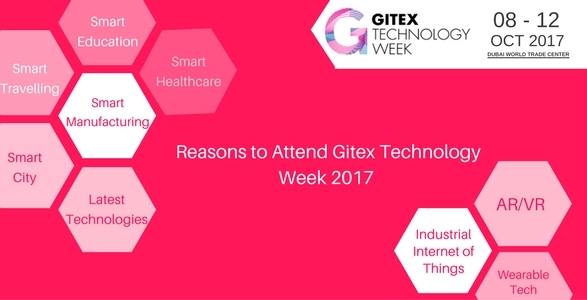 When we talk about trade shows then the biggest one that captures my mind is Gitex Technology Week So let me give you the reasons why should you exactly attend Gitex technology Week 2017 (8th – 12th OCT, 2017) Dubai show. Gitex Technology Week is all about Technology, Hardware, Softwares, Products, Buyers and Suppliers with focus on Internet of Things, Augmented Reality App Development, Virtual Reality Solution Development, Wearable Technology Solutions, Hardware Integration Solutions, Location Based Technology Solutions, Smart Industrial Solutions such as Smart Manufacturing, Smart Healthcare, Smart Retail, Smart Education, Smart Finance, Smart Travelling, and more. Not all events cover multiple trends in technology and industry under one roof. So Gitex Technology Week 2017 is a great opportunity to explore and expand your business and skills and take your organisation into next level. We at CDN Solutions Group are exhibiting in Gitex Technology Week 2017 for 9th consecutive time . We are an IT service provider company specialised in web app development, mobile app development, eCommerce development, software development and latest technology solutions. Our delegates are ready to present before you exclusive solutions related to your industry vertical that will definitely solve your pain areas in business at stand SR-F4 in Sheikh Rashid Hall, Dubai World Trade Center. Our world is becoming increasingly digital and technical, so as a technology service provider company, we prepared a vision report of Middle East industries who have yet not overcome from their digitalization and technological pain areas and based on that data we will come up with specific solutions. Throughout GITEX Technology Week CDN Solutions Group will showcase how digitalization and technologies are impacting industries. Visitors at GITEX Dubai at stand SR-F4 can experience CDN Solutions Group future vision of technologies for industries through multiple demos. So what are you waiting for, get in touch with us for your app development, custom software development or latest technology development requirements and do not miss to avail free pass to explore the Gitex Technology Week 2017 event from us. (Passes are Limited).